We literally couldn’t ask for a better pup for us. He’s loving meeting lots of friends and learning all the sounds of the city. Thanks for breeding such a great litter! Brody (formerly Grumpy of Isis and Bandit) is still doing great. At nearly 1 year, he’s 50 lbs and still growing slowly. He’s a beautiful bouncy boy who’s as intelligent and intuitive as he is handsome. Since I brought him home, we’ve bonded to the point where a look says more between us than commands. Today, I officially registered him as an emotional service animal. I hadn’t planned to do so until recently when I found that my anxiety is greatly improved with his presence. He is exceptionally in tune with me. It’s hard to believe how close we are after less than a year of knowing each other. He got neutered almost 2 weeks ago and did great – no complications at all. We’re looking forward to him attending puppy daycare soon so he can make more friends. Thank you again for the opportunity to add this boy to my little family. I still don’t think I could love him more than I do today, but every day I do. I wanted to send some pictures of Stella. She is an awesome dog. She is very smart and has picked up on routines of our family. She snuggles with CJ. She has gotten him a little more active which is good for the old man! Stella is crazy about water. She loves playing in the sprinklers or if I am watering the garden by hand. We are interested in getting another Moyen Poodle to keep Stella company when we have to say good bye to CJ. We are not sure how much longer we have with him so I am trying to look sooner rather than later. Just emailing to share with you Molly’s first birthday. She turned one year old on Saturday, May 26th. We had a Brunch Buffet to thank the many people who guided and supported her first year. What a demanding and rewarding adventure it has been! She is a dear soul, full of energy and eager to meet all dogs and people, ever on the lookout for squirrels and rabbits. She is 38 lbs. I love just watching her move – she prances happily and loves to retrieve. Her favorite activity is peeking at a running bath or into the shower – clearly a water dog. From her vet to casual acquaintances, she is deemed sweet natured. I credit you with her personality, Terry, thank you. Born 1-7-18! Best friend ever so sweet, loving and smart! Thanks for bringing her into our life! Louie (Hoagie) is just perfect for us. Thank you! Hi Terry – hope all is well. Been a busy month! Joey got his MACH a couple of weeks ago! He already has 4 QQ’s towards his next championship – he needs 20 and he has more than enough points, he will get his second MACH pretty quickly. Attached is a pic of his Labor Day trial ribbons He qualified in 12/13 runs – with 7 first places – he even beat a large, fast, young border collie! His lines are tighter even thought the BC runs faster. We are qualified for AKC Nationals and we are going. My trainer is pushing us to get us ready – so excited to go! He will run in the DOCNA Championships next weekend. If I keep my act together he should clean up. He loves his puppy! Esme (my senior rescue) does too. I caught them playing several times, they often sleep curled up together. She has fit in so nicely. She is over 20lbs already and growing fast. She hated ball therapy for her base narrow canines so I have been giving her lots of Kongs and other things to chew on, and they are moving in the right direction! Tom thinks her adult teeth will be fine so we have left them alone. I think he was right. We’ll see what the next few months bring. They were poking the center of the upper jaw and are now on the edge. So the path for the adult teeth could be on track. She tried lure coursing today – but was more interested in the other dogs. We’ll try again. But I don’t really care it was more about her having some time with me and not Joey – she adores him. She’s very smart – a problem solver! I don’t want to be in the expen – I’ll climb out! That was day 1. She starts her agility work soon (I have a hard time keeping her off the equipment in the yard – she’s a natural!) and she is going to a regular puppy class just to start working around other dogs. She can already wrap a cone, play the nab game with the teeter, and is not afraid of things that move. She goes to a target, hand touches, sit, down, getting good at “leave it” and stays. She has started on the skateboard, is very funny with puzzles – she goes for speed! I don’t know how but when I have to go in to the office – she does not potty in her crate – even though I leave her with a pee pad (its a huge crate). Working towards grooming – I touch the clippers and Dremel to her daily. She lets me Dremel her nails and shave her rear – she’s not quite ready for the face, but I don’t care, we’ll get there. And she is a adorable. Id rather wait til she is comfortable enough to have a good experience. I have a big walk in shower – can’t keep her out of there so she is always freshly bathed. She is very independent and curious. Joey was much more clingy – girls! 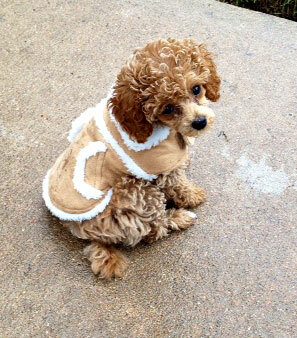 She hates the leash and harness – she wants to be in charge of her own body – my little feminist puppy. She is getting better and did really well at the open space park when Joey lead the way. What an awesome little girl – she’s. A lot of fun – very food motivated, likes to play with toys – easy to train. Let me know when you get the litter registered and I’ll get her the AKC number. Lots of time – but I don’t want to forget! Because of her markings people think its snoopy – too funny. Attached are more photos of Brody since the last time I emailed. In the past few months, we’ve learned that he is sweet with all dogs of all sizes, puppies absolutely adore him, and he adores cucumbers! Just wanted to check in and update you on River. She is more than I had ever hoped for. I have known for years how incredible the dogs you breed are, but River has blown that knowledge through the roof. She only ever had two accidents and rings the bells by the door to let me know she needs out. She picks up on commands so quickly and has already learned the anxiety alert. What she has done for me in this short amount of time is more than I can ever thank you for. She’s already 20 pounds and about 16″ at the shoulder. Every one she meets falls head over heels for her. She became my everything from the moment I picked her up. I just wanted to thank you for Snoopy – I named him Jax. I am so in love with him, he is so sweet, obedient and smart. I am astounded how much he knows already at 9 weeks old. I bring him to work with me and he occupy’s himself quite a bit and of course still sleeps a lot. He’s been sleeping through the night for two nights already and I just got him Sunday. He is such a blessing to me. We start puppy training on Saturday. I am very thankful I found you and will let others know about you as well. Well, Terry, I have fostered and raised many dogs in my life but I have never had such a smart, well adjusted, confident, calm pup as Dandie and Houston’s Powder River Mountain Marigold. It is hard to believe she is only 8 weeks old. She is easy to train and is getting on well with my older poodles. One is her playmate, the other is teaching her dog manners. Her best friend is a Mau kitten I have. I have been taking her out and I get asked about her color. She is eye catching. I did some preliminary health/orthopedic screening tests at work and, of course, no issues. I will get a CHIC number for her later on. Thank you and Richard for our Marigold. I will keep in touch as she grows. Timber – we are so proud of his great work with people of all ages! Terry, Wilson is doing amazing. She has learned her tasks, and has completed her basic obedience. She is one hell of a dog. She loves people, so we are still working on her not going up to them when she is on duty. She is losing her puppy teeth! She currently has 1 tooth on the bottom and she looks so silly. She loves college and being able to play with my hallmates. I was in the hospital on Tuesday night due to my POTS. She did absolutely amazing. She layed with me, did DPT, and didn’t bother the nurses or doctors. Dear Terry, We wanted to share an update on Gryffin from the Rick Grimes and friends minidoodle litter. He is 17 months old, and has fit into our family perfectly. We all adore him! You guessed he would mature at 30 pounds. At his recent visit to the vet, he was 29.7. He is an ideal size for us. He’s small enough to fit in the backseat with the two girls, and big enough to occasionally be a pillow for them. He adores snuggles and has decided he might just be a lap dog after all. If anything, his fur has lightened up a bit overall, although he has some neat variations throughout his coat. Gryffin also loves time with his family, exploring new places, pup playdates (he has quite the social life including several best buddies in the neighborhood), meeting new friends (human, canine, feline, etc. ), working for treats, and–now that he is a mature gentleman–sleeping in. He self-regulates really well with food. We offer him two meals a day, and he eats what he is hungry for. He is not the bravest dog in the world, which is fine by us, as he seems to know how to keep himself out of trouble. One day a little while back he acted terrified of leaving the house and absolutely refused his morning walk. We found out later that a coyote was in the area that morning and had attacked a dog within a few blocks of our house. Clever boy! We haven’t pursued canine good citizen with him yet but we plan to, and don’t expect him to have any problem. This probably goes without saying, but he does not have an aggressive bone in his body and only wants to befriend everyone he meets. For a while we had an issue with him jumping up on some of his beloved humans but he has now learned to sit and look charming instead. One of the training tasks that he currently finds the most challenging it to be put into a “stay” while we allow the girls to walk ahead of us. He thinks it is his responsibility to keep tabs on them, but has responded very well to this exercise. Once we give the release command, he catches up to them in a hurry! I think moderate energy is a perfect description for him, which is exactly what we wanted. He loves walks and playtime, but as long as he gets his regular exercise he is pretty mellow the rest of the time. We recently got the permit to allow him to be off-leash/under voice and sight control on certain Boulder trails and he’s doing beautifully with it. Today he hiked about 4 miles (I’m attaching a couple photos). He loved it and has pretty much been sleeping since we got home. He has become such a part of the family that it’s almost hard to remember life without him. Thanks again for helping us connect with such a wonderful dog and companion. Simon from the chipmunk litter( new name is Timber) is doing great. He loves his kids, his toys, playing soccer and hiking. His favorite treat is an apple slice. He gets sad when dad won’t let him on the couch. We are building a new house, and Timber enjoys coming to hang out and supervise the project. He sticks close by when off leash and is doing well with training. Thank you for breeding such wonderful companions. Hi Terry! We can’t thank you enough for our perfect puppy Zuma!! He is AMAZING with our kiddos….. you sure did help us pick the PERFECT addition to our family!! Hi Terry, wanted to give you an update on Zack. He is just a wonderful pup! Very smart, almost house broken at 12 weeks, only cries when he needs to go out. He sleeps on his pillow above my pillow in our bed, but also jumps in his little blue crate whenever I need him to. He goes to our office most days. Just coming back from a trip to PA to visit family and he is just a happy boy! He has had a couple baths and one full groom. He was very good for that. He is not a barker and just goes with the flow of whatever we are doing. He is a little mama’s boy and gives me kisses all the time. He and I are bonded already. He knows how to sit, get on his pillow on demand and get in his crate on demand. That is quite impressive at 12 weeks. We just love him. Just wanted u to know. We wanted to give you a little update on Gryffin (formerly known as Daryl). He is a lovely puppy. He is four months old and about 15 pounds. I asked the girls what we should tell you about him. Beatrix (age 5) said, “He’s the best in the universe because he is the cutest, fuzziest, and fluffiest.”All very true. Several strangers have told us he’s the cutest puppy they have ever seen. Cordelia (age 8) said the best thing about him is how much he loves people. Oh boy does he love people! He is deeply attached to his family, and as you said, never meets a stranger. I think one of very favorite activities is meeting new human friends. He loves new canine friends too. He can be cautious with new dogs at first but as soon as they show themselves to be friendly, he is ready to play, play, play. He is potty trained and knows how to ask to go outside when he needs to. He was not a big fan of the crate so once he could hold it overnight we started letting him sleep in our bathroom, behind a baby gate. He puts himself to bed and rests quietly until he asks to go outside to pee around 5:30 AM. Then he will go back to sleep if we ask him too. The vet and the groomer have both been very impressed with him, and how sweet, tolerant, and friendly he is. He is still a mouthy little guy but we know that is normal for his age and we are working on it. He was the star pupil of his puppy obedience class. Our trainer said she thought he was the best-tempered miniature goldendoodle she had ever met. She also regularly told the other families in the class that we were “cheating” by working with him because he learned things so quickly. We graduated from the introductory class last week (see photo) and will begin the intermediate class next month. He absolutely loves training and brings a great focus to our sessions. He is now fairly consistent with sit, down, touch, watch me, place, leave it, drop it, and come. We are working on distance and duration with stay. We walk him twice a day and he will walk nicely on the leash for somewhere between 2 blocks and 2 miles depending on his energy level, the heat, and how many distractions there are. Most importantly, we just adore him and find a lot of joy in him every day. Thank you for connecting him with our family! Terry, Thanks for the advice, Quinn is settling down much quicker when he is confined, though he makes it very clear that he prefers to have free access to his people at all times! He is also walking well on the leash, though again he prefers to be unrestrained and follows us nicely while off leash. Terry, Wanted to drop you a note and let you know that Lexie has settled in just fine. She is now 14 weeks old and is such a joy. She is 100% potty trained to the pad, and hasn’t had an accident in over 2 weeks (now watch, she will show me). Butch and I sit and laugh at her all the time. She knows she is the Queen and we are here to do her bidding. She is rapidly coming along with commands – she is sleeping 6-8 hours each night, eating good, knows her bed and doesn’t mind being put in it at all. I am attaching a picture of her taken today – after her first grooming experience. She did great. She never meets a stranger and enjoys playing with our neighbors 2 dogs. She thinks she is just as big as they are. Butch and I laugh and say that if the tiny red sister was expected to be the live wire, Terry should see this one. As you can probably tell, we love her very much and are so happy she is a member of our family. Thank you again for our Lexie. Hope you have a very Merry Christmas and Happy New Year. Hi Terry – hope all is well at the ranch. Hard to believe its been 2 years! Im sorry I haven’t written sooner. Joey is amazing (Powder Valleys Joltin’ Joe). He started competing at agility in April, he is already at the excellent level – close to masters! (5 titles) Mostly first places. You described his personality to a T – he is indeed pushy, but in a good way. He loves to train and will bug me until we do something. You had said he would not be a great pet dog for anyone inactive – so right! Its impressive when a breeder really understands the needs of a puppy. At 4 months he pushed his way to sleep out of the crate. I gave in. He sleeps on a dog bed, never an issue. His favorite is when he knows its bedtime he runs and jumps onto my bed and pretends to be asleep on my pillow – its hilarious. He moves when I get into bed. He was super easy to potty train and to train in general. In short, he is brilliant. He is not only qualifying in agility – but in Time to Beat he has come in second just after a much more experienced border collie! I hope to take him to nationals, possibly next year. But he is already a champion in my book. He was never destructive at all. Attached are some pics of him. I absolutely adore him. Thank you for the honor of loving, owning and playing with him. August 25, 2015 Hello Terry, (name withheld for privacy) was so happy to see Jake’s (Gigolo’s) first puppies! The markings are perfect ~ a mixture of both parent dogs. These will be great dogs I am sure. We certainly love our Jake! (Name) and Jake are doing wonderful together. Jake has traveled some this summer with us ~ including a road trip to Saint Louis, Missouri and a flight to New Bern, North Carolina. Jake was so calm and well mannered. We got an ESA pass to fly Jake with (name) (letter from his therapist) and it was no problem. Even flight attendants commented on how good Jake was ~ one stating that Jake was the best dog she has ever seen on a flight! He sat right at our feet the whole flight (four planes total coming and going) without a whimper. Boo, flying over an obstacle to retrieve a dumbbell! 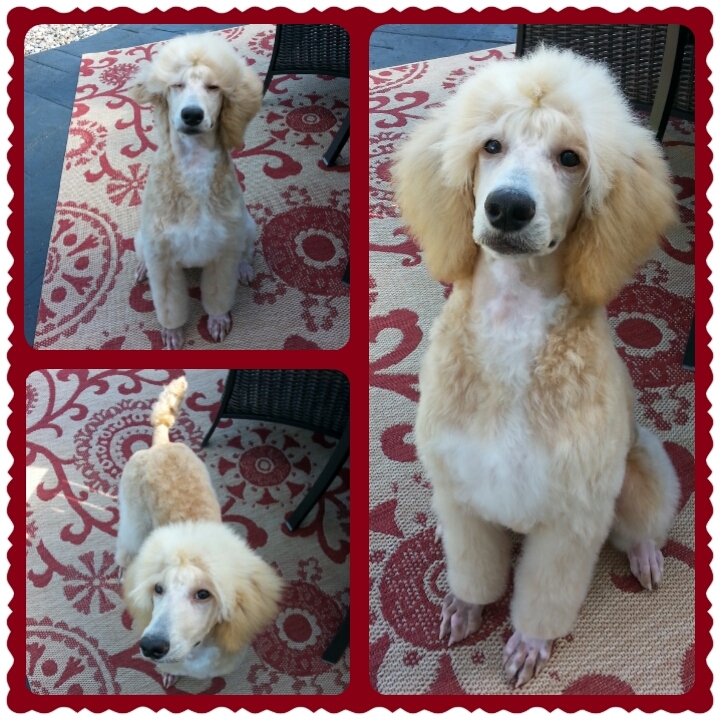 Scroll down for an early update on Josie, plus photos of her very first puppy trim! Hi Terry! I just wanted to tell you what a joy little Grackle is! He is just wonderful! He is so affectionate! And he’s already ringing the bell to go outside!He has not had ONE accident in the house (at 9 weeks!). We are having a blast with him. He is as smart as they come and we wanted to tell you how overjoyed we are with him and how thankful we are. Thank you, thank you for helping us pick him out. Well I have been waiting until we picked a name to send you an update. We are almost certain that Chanel is now Josie. She is precious! We love her so much already. She’s doing awesome with crate training and house breaking. In fact, she slept until 6:30 this morning never making a sound or having an accident in her kennel. She tortures the cat (who honestly seems to enjoy the attention) and she follows our old dog around just in case he decides he wants to play. He’s enjoying her, too. She seems to have brought a bit of life back into him. He wrestles with her and sometimes gets the energy to run around the yard with her. We are so impressed with how smart she is! Not only is she doing great with going outside to potty, but she’s actually catching on to the fact that we want her to go in a certain area. I’d say 85% of the time she goes there…..even stopping in the middle of play time to run over there and relieve herself, then bouncing back over to finish playing. We are just blown away that she’s catching on in less than a week! I was anxious about how should we do with our boys. I thought she might be afraid of them since they’re so much bigger and kind of loud. But I was wrong! She stays right with them, wanting in on the action. This is their first puppy and they adore her. Thank you, Terry, for breeding such wonderful dogs. I told you before I stalked your website for four years while waiting for the day we were ready for a puppy. I was always impressed with your breeding practices and I’m even more so now. Thank you for our sweet little Josie! She is perfect! “Major” as a young pup and now, with his new master, Jack! Hi Terry! I wanted to send a quick note with a thank you for our great puppy Frodo (formerly “Michael” of Rowdy and Ladybug’s “diva” litter born 9/18/2014). He is incredible and makes us laugh every day. At 21 weeks old he just completed his puppy kindergarten class with flying colors. He is fully house trained and rings a bell at the back door when he needs to go out. He sleeps 7 hours regularly in his crate at night. He can sit, lay down, come (most of the time if there is nothing better to do), stay, fetch, roll over, play dead, and shake on command. He is an excellent walker on his leash and we already go 2 to 3 miles a day. If there is no lap available he is found happily sprawling out on the sofa or in the sunny patch on the floor. We just adore him and he loves each member of our family equally in return, happily greeting us no matter who comes in the door. My daughter took this beautiful photo of him with her ipad while he was in her lap and I wanted to share it with you. Thank you again! We couldn’t have asked for a better puppy! Dear Terry & Toni,Thunder was whelped on tax day April 15, 2011 so he’s approaching his fourth birthday and he just keeps getting better at everything that he does! He passed his CGC when he was still a little pup and moved forward with a few great SD trainers in not only assisting me physically, but according to all my doctors and PT/OT & MT therapists–Thunder has more than significantly contributed to my recovery from the African strain of bacterial meningitis (from which 1/3 of the 1500 patients infected in 2010 died~even w/treatment and of the remaining 1000 less than 5% have recovered as well as I have. In honor of you most generous gift of love and caring I am currently cross training Thunder for work as a Therapy Dog. We currently make surprise visits to children’s hospitals & wards (right after Thunder has been groomed & is all fluffy and soft for the kids to hug. Thunder performs a few tasks like getting a bottle of water from the day room refrigerator, finding & bringing me my keys, cell phone, handing my credit card out per my commands, etc. I remain permanently disabled per the Social Security Administration, I am devoting the rest of my life passing forward the hope that you two ANGELS gave me. Thunder goes far beyond any dog (and many people) in saving my life and giving it purpose. Thank you two beautiful people, I hope someday I might meet you so that I can hug & kiss you both. Wish I could show you the ear to ear smiles & laughter that Thunder & I are honored to receive, but the hospital has a patient privacy that prohibits my taking pictures or video of the kids–which I understand & agree with…so you’ll just need to imagine, kids on dialysis, chemo, wearing bandannas to cover their hairless heads-ALL SMILING, GIGGLING, LAUGHING AND EYES GLOWING WITH JOY—I hold back my feelings until I’ve left and I in my wife’s car driving home–then I cry like a baby nearly the whole 40 minute ride home. Knowing hope large your hearts are, I know that you’ll understand–besides I have Thunder licking my tears away. Hi Terry, We wanted to send you an update on Ruby‘s (aka ‘Audi’) 1st birthday to let you know how she is getting on. First of all we want to thank you for breeding such a wonderful dog! She is such a love bug, she wants to make friends with everyone she meets, people and other dogs. She picked up on house training very quickly, she was also quick to learn her basic training, she is still very much a bouncy puppy and we continue to enjoy training her to be a lovely lady. She has been an amazing addition to our family, she is extremely good with our 8 year old daughter Megan, who absolutely adores her. In the warmer months she goes swimming virtually everyday, she is a little water obsessed. We have had so much fun taking her on lots of adventures. We picked Ursula for Isaac because children with autism tend to struggle having relationships with their peers because of their communication issues. Isaac was drawn to the therapy dog where he received speech therapy so we decided to find a dog that would provide comfort and companionship for him. Ursula was the perfect fit. She is tolerant, sweet, fun and follows him everywhere. She has taught Isaac responsibility and also provided him with a very special friendship. We are so happy we found this sweet girl for him. Major as a pup, AKA “Paso Doble” of the Ballroom Dance litter! Terry- Just thought we’d fill you in on our first day. Gretel (formerly “Magpie”) did just fine on the ride home, and was curious enough to press her face against the window most of the way. She’s been eating just fine and hasn’t had an accident in the house yet (fingers crossed…). Sleeping is great too, she barely whined overnight as we followed your guidelines. Thanks again for bringing such a great dog into the world. We love her dearly. David and Family, Fort Collins, CO.
Hi Terry and Toni, Ronin is doing just great! We are pleased to see how quickly he is picking up on potty training. Today he went to the door, went right out and pooped! Yea! He climbs up a long flight of stairs all by himself to come back in. Last night he didn’t cry at all, we did take him out once to be sure he was comfortable. UPDATE FROM RONIN, OCTOBER 2014! Tilly (our son named her Tilly Tail Taylor!) has been such a sweet addition to the family. Her favorite place in the house is our 5-yr-old’s bed – when he wakes up in the morning, his first words are, “Send her in!” And we do. They are very excited with one another. Tilly is tolerant of our now 8-month-old’s attempts at petting, even though he’s still learning about open hands rather than combing or pulling her hair with his fingers. She likes to lick his fingers and toes, which often have residual applesauce or banana. His halting efforts to eat solids have helped Tilly bond with him, to be sure! Tilly AKA “Mercedes” as a tiny pup! Terry, we cannot thank you enough for our well rounded, loving, playful, little cuddly happy ball of black fur, Webster. “Oh”, and lets not forget smart, smart, smart! We lost Abby’s brother of 9 years and were concerned how she would react to a new family member. You guided us through the meeting process and as you can see our concerns did not become an issue, they bonded very quickly. Each day is a joy waiting to see what he will explore and learn next. “Looks like the planter will be 1st”. Christmas was a hoot, you can just see visions of sugar plums, Pet Smart and toys dancing through his head. You are so appreciated! Deb and Steve, Loveland,Co. Webster, aka “Charleston” of the Dance Litter! Hi Terry and Toni! I hope all is well and the holidays were good to you. Joey is amazing! And you were so right about his temperament. I think he’d be bored and prob misbehave if he wasn’t challenged to learn something every day. He hasn’t once chewed anything that wasn’t his. He loves to learn and gets jazzed when he sees me get the clicker and a pocket of treats. And he is quite jealous when I work with Henry. I’m doing a lot of shaping with him – he has learned to drum on a bucket and we are working on the skateboard (and numerous other tricks, plus going thru tunnels and wrapping around a cone, etc etc. He started agility foundations class and he is so focused and wants to work. He has little interest in the other dogs. And one is a friend of his that has played with him several times. I can’t wait to start serious training. He is gonna be awesome! Natalie adopted Allie to train and then place with her elderly parents in California. It looks like she’s doing great! Thought you’d like to see this picture of Allie in Home Depot (below, with flowers). She’s doing just wonderfully! She’s weighing in at 23.4 pounds! My parents are keeping up with her progress daily, and she’s going to make the best companion dog for them! Boo and owner with Summer 2014 winnings! Fall 2014 UPDATE: Boo got his last Rally leg and Rally Excellent Title this week with a first place! A year after our Labrador Retriever died, we were finally ready for a puppy. We surprised the kids with a long car trip one Friday evening… 10 minutes prior to arriving at Powder Valley Poodles we told them we were picking up a puppy, and they were so excited! Stella has been a great addition to our family. She quickly came out of her shy shell to keep up with our 4 and 6 year old boys. She has taught them to be responsible and to be leaders, as they help raise and train her. She loves everyone she meets with tons of enthusiasm and they immediately love her. She is a very smart, happy muppet of a dog. — Andrea L.K. Hi Terry, I’ve been meaning to write you for a while about how our wonderful, cute goldendoodle Roxy (formerly Syracuse) is doing! We started training classes when she was 12 weeks old and I am proud to say that she is the STAR of her class!! She 18 weeks old now, is so close to being house trained and LOVES people! The first 4-5 days with her were a dream- she didn’t get carsick, she slept the whole night, and was so calm. Even now she is very calm for a puppy. We are clicker training her, which she takes to very well and really has a desire to work – her focus is incredible! We believe she is going to be an incredible therapy dog as she loves the kids and is very tolerant- you can hold her any way you want and she will be happy 🙂 Thank you for such a wonderful goldendoodle! Kylee A.
Terry: I have been meaning to email you for over one week. I just wanted to provide you with an update on how Merlot is doing. We spent the first three nights together, sleeping on the couch in the living room. She, Martini and I all shared the couch and slept peacefully through the night. She is now able to sleep in her pen by herself from 9:00 pm – 7:00 a.m. without so much as a peep. She doesn’t like doing her duty in our side yard but she is very, very consistent about going on her puddle pads, bothpee and poo. She is walking on a leash very well and she loves to chase Martini when he is chasing a ball. I took her for her first wellness check up and she was excellent. The doctor and nurse fell in love with her. She has been micro-chipped and she will be seeing the doctor every two weeks through July for the rest of her shots. She is the best puppy I have ever had and we are so happy to have her be part of the family. She is very good too, at the Day Spa. I take her with me every day and she is so quiet, nobody even knows she is there. Thank you for breeding a fantastic baby girl. I have already recommended you to several friends in town who are looking for puppies in the near future. Hi Terry, I have been meaning to write you for some time now and share a pic of Hugo / Oboe with you. He is a GREAT dog. And you did well suggesting him for me – he is laid back, a good companion, but also playful. He is super smart, learning fast, impressing everyone he meets and growing. He is almost 65 lbs now. The vet said you were right – 80 to 85 will be his final weight range. He went thru his surgery (neutering) fine, just minor issues with the sutures afterwards. Other than that period and some giardia from rabbits in the yard, he has been healthy. The vet was immediately impressed by his maturity and social skills, and said he was way beyond puppy classes when she met him in Dec. He has stayed at three different kennels in this area and in each one, the staff love him. They can put him with older mature dogs, puppies, big dogs and little dogs and he does well with all of them. (He’s even been known to coax small, shy dogs out to play!) He’s been introduced to other dog owners – while at the kennels – and people have been asking me where I got him. 🙂 He’s great with people – old and young, even little kids and babies. He’s very sweet and gentle. He rarely barks, unless he is alerting. He never barks at other dogs – even the occasionally aggressive/poorly trained ones we meet on walks! Warm bed by the fire, and toys for Sophie! Terry, Merry Christmas to you and yours! I still have not figured out my camera so am sending this picture of Wilkes (first known as Major) that I took on my cell. He was relaxing after an evening with 18 of our friends and family for Christmas Eve. Wilkes just takes it all in…by far the most loving and laid back dog I have had in my 60+ years! He is now 67 pounds and 25″ at the shoulder. I showed him in a 3 day UKC show in November in Denver. He was great the first day…took best in breed for altered poodles and 2nd in the Gun Dog Group, beating out 5 other best of breed winners. Doug and I are feel so lucky to have met you and to have Wilkes become a member of our home! – C.M. Terry & Toni: I just wanted to give you a quick update along with a few pictures. I know every person that is lucky enough to get one of your poodles thinks that theirs is special. However, Sophie truly is!!! She is doing wonderful. She is a happy, playful puppy who also enjoys lap time (my favorite). After the first week, she sleeps all night now without going out. I am really glad of this because the last time we went out in the middle of the night, there was either a wolf or coyote staring at us — scary!! Sophie has learned to sit already. She also likes to play ball and, usually, brings it back. She is my constant companion and I’m loving every minute. Thank you!!!!! Dear Terry and Toni, Just a note here to let you know that we made it home safely to Spearfish Friday night. Daphne was a trooper for the looonnnggg car ride. She slept most of the way, including our stop at Texas Roadhouse in Cheyenne. Daphne went easily into my “puppy purse”, took a nap and was a perfect angel while we had a late lunch/early supper. I’m afraid with the long car ride home Friday we got Daphne a bit off schedule. We played and played after getting home and it was nearly midnight before we got to bed — Daphne in her kennel beside me. I was pleased that she let me sleep until a little after 6:00 Saturday morning. Yesterday was a busy day, exploring her new home, meeting the rest of the family (our two cats) and getting used to the new surroundings. Several friends and neighbors were very excited to meet our new baby and came to visit. It was fun but we were wore out early and headed to bed shortly after 9:00 PM. I wanted to let you know how much Thunder has meant coming into our family. He has given Steven a renewed reason to live and something to work toward for many years to come. Our plans with Thunder are enumerable, but in every case, it means good things for those young and old. Of course the first and foremost will be his service to Steven, and so far his companionship has relieved a great deal of anxiety for me as well. We were so pleased when we had his first real haircut done recently. Now we can see his exquisite body and we get many ohhs and ahhs from the neighborhood on walks. And, the groomers adored him so much the whole place had something to throw in about his great nature and how well he did for them throughout the whole procedure. He was so well liked, the front desk lady kept him sitting with her until we arrived! And he’s a real lover. He licks and kisses and loves to play, especially run get and bring back the ball. When he grows into his adult body, his beauty, intelligence, and delivery of service will be awe inspiring! Thank you so much again for bringing these wonderful dogs into so many lives. We love you for it. — Deborah S.
Terry and Toni, Before the update, please accept our thanks for your professionalism and kindness. Milano is a delight; his upbringing shows. Milano is now Barney. We tried out half a dozen names and that one stuck. (If you’re fans of How I Met Your Mother you’ll know his namesake.) Barney made it home without incident and was introduced to Coco by our neighbor. Coco is not yet a fan; he’s snapped several times so they are both being carefully watched. We have three stairs from our back door to the yard. On his first approach, he struggled to get his round little belly up. Since then he’s learned to hop up the stairs like a bunny. Super cute. You were right, Terry, about him being a quick study. He’s also learned how to get out and in the house. He’s peeing and pooping outside. Just one pee in the house. (at 8 weeks-old!) Barney follows Mary-Claire around the house although we’ve limited his access to just a few rooms. He slept with her last night and did well. He went out twice and took to his crate (almost) immediately. We’ll transition to crate/pen/pad in several days. We’ll keep our eyes on your website for the next puppy class. You’ll see us there! Best, Joan , Fort Collins, CO. The family that adopted Arrow is from Russia. They bought Arrow for their son’s birthday. What a great birthday present! Thought you might like to see a current picture of my Teddy at 5 months old. My Teddy is still just as sweet as he was when I brought him to my home. He will not let me out of his sight. He loves people and animals. He sleeps with me and usually falls asleep in my arms. I’m sorry it’s been so long to write. My name is Bronwen and I bought my perfect little Bella from you a little over a year ago. You used to call her Tinkerbell. She is the best companion I ever could have imagined after I lost my beloved Mr. Crackers. Bella fits right in to my life style, it’s amazing. My Mom in the nursing home with brain cancer waits patiently every day for Bella to come lie down in her bed and be her comfort, she is an exceptional dog. She doesn’t mind the grandkids noise, and her best friend is my 12 lb calico cat who plays all day with her, but would never hurt her. Some day I’ll figure out how to down load pictures off the camera or phone and I’ll send them to you. I have a couple of retiring friends that are interested in buying a pup from you. I told them your web site and that to look at Breeze and Pepe’s new ones, but there are more colors and sizes, but everyone likes Bella’s size. She’s 4 lbs. Thanx, Bronwen, Boston, Mass. 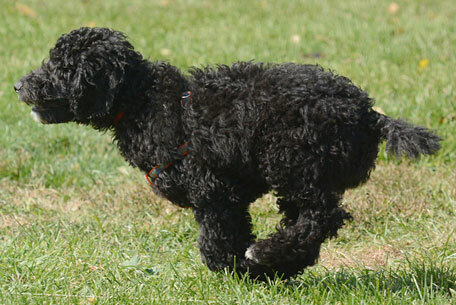 Terry, I took Wilkes to the UKC show in Longmont on 7/20 and entered him in the 5 month-old Standard Poodle Puppy class. He was the only puppy entered, so after the class I asked the judge to be honest with me as to his UKC show potential. He said Wilkes has a lot of potential, has a “great top line” (whatever that is) and is an “outstanding mover if his handler doesn’t mess him up” ! Judge also suggested that I take a handling class!! I’m not sure if I will continue to show him in confirmation as an altered male, but am definitely proceeding with his obedience training with possible shows in that area later on. Thank you! Great Testimonial! Do you have any current pics? I can translate what the judge said for you! A “Topline” is the dog’s back as viewed from the side. It should be even and should not bounce up and down or side to side when the dog “moves out” (trots off). A great topline usually means that the dog is a “fluid mover” (your judge said “outstanding”, that is VERY nice) meaning that there is little or no excess movement (up and down, side to side, no bouncing) which is good as it implies the dog is very well put together and should have few if any orthopedic problems. A “handler messing him up” means that the handler allows the dog to move either too slowly, too fast, or in the wrong gait which doesn’t show the topline to its best advantage. Showing is fun when you have a really good dog (which you do). A handler class would be easy, quick and allow you to really show him off to his best potential. To anyone looking to purchase a dog or puppy from Powder Valley Poodles: I have bred, trained, and owned Standard Poodles for over 25 years. They are in the top tier of canine intelligence, capable of learning an average of 250 words/commands-object names (versus the average canine’s 150 word capacity); they are extremely eager to master skills, very sensitive to their owner’s/handler’s needs; as a retrieving breed–they naturally deliver items to hand. They are one of the least allergenic canines and they can be groomed to accommodate virtually any climate. They are naturals for working as Service /Assistant /Therapy /Mobility and Companion Dogs! Terry Jester and the team at Powder Valley Poodles have not only created the ideal environment for raising the best potential Service and Therapy Dogs, but they have also established the groundwork for producing the healthiest dogs with the best natural temperaments for this work. I suffered a brain/spine infection which has left me disabled. One very important factor in choosing a good Service Dog is HEALTH. 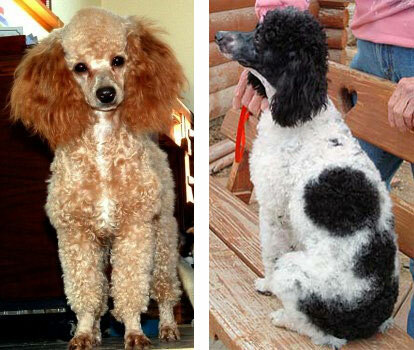 Powder Valley Poodles only breeds thoroughly health tested Sires & Dams, in addition to their great AKC lineage. 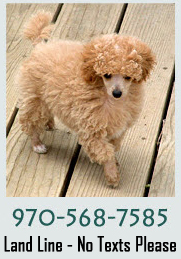 While health is important, it also takes a very special dog to perform this type of work and the combination of Terry’s dedication and love of Standard Poodles along with her many years of experience as a behaviorist has resulted in an environment of socialization, learning and performance unlike any I have seen or experienced! My 11 week old Standard Poodle arrived at our home, already housebroken and following almost all of the five basic commands (sit, down, stay, come and heel~~heel is a work in progress)….and he was not even one of Terry’s “started puppies”–had little formal training.. WOW, I never was able to get my puppies that much on track at such a young age! For the past year I have done vast amounts of research, talked and corresponded with breeders, disabled owners of Service Dogs, dog trainers and group forums for disabled users of Service Dogs from all across the country. In the end, my final decision was to seek one of Terry Jester’s Standard Poodles and consider myself very fortunate to be able to say that she picked the exact perfect poodle for my needs. That’s what she does, she matches the right dog for the tasks and the people, and she is the perfect matchmaker! In only two weeks, the progress that my dog and I have already made makes me confident that he and I will always be happy together and that he will be the very best Service Dog possible for me! KUDOS TO TERRY, TONI AND THE POWDER VALLEY POODLES FOLKS!